25"x30" Silver bugle bead edge veil with rhinestone and crystal accents (72" wide, standard cut). No Returns Accepted on this item. 45" Metallic beaded edge veil with silver and clear bugle beads and rhinestones (72" wide). No Returns Accepted on this item. 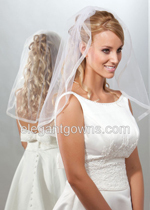 36" Floral design veil with clear bugle beads and rhinestone accents (72" wide). Only available in White. No Returns Accepted on this item.